So much tragedy. So much legendary music. 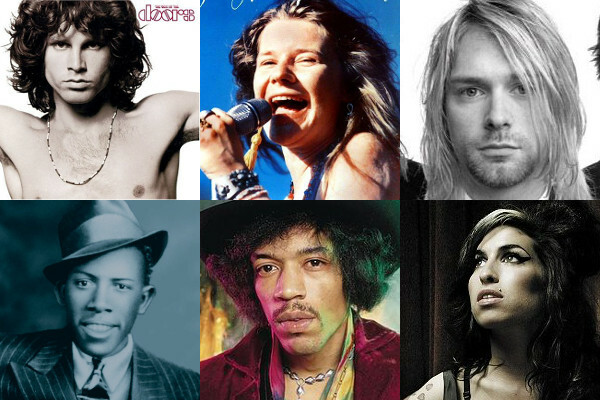 The 27 Club, for those blissfully unaware of this legendary coincidence in rock and roll, is the name given to a collection of musicians who tragically met their end at the tender age of 27. Popularized after the death of Jim Morrison in 1971 - who was the fourth famous 27-year-old musician to die over the course of two short years, after Brian Jones, Jimi Hendrix, and Janis Joplin - The 27 Club has taken more than 50 promising musicians since blues legend Robert Johnson famously kicked off in 1938. Some believe the trend to be a legitimate curse, citing vague supernatural reasons, while other conspiracy theorists cite more sinister explanations for why so many talented figures in the music industry meet their untimely demise at this specific age. It remains one of the most unfortunate coincidences in the history of music, and with each subsequent musician who joins the club, the mystery and myth grow. The only thing we know for sure about The 27 Club is that there's no shortage of iconic, lasting music to come from its members. Indeed, it's a little eerie just how many mind-blowing, classic albums were recorded by the people found in this list. Note: To keep this list from feeling too lopsided, and to give credit to some musicians who are too often glossed over when discussing this group, we're going to limit it to just one album per artist.